With 24-hour door monitoring and increased in-and-out visitor registration being enforced in the dorms, it’s clear that campus security is on the rise. But what paramounts all efforts to improve security is the fact that University Police are now being trained and equipped with electroshock weapons, more commonly referred to as stun guns. After multiple non-residents were arrested at Mary Ward Hall last spring semester, and an armed robbery took place on Buckingham Way last February, safety concerns have understandably raised questions about the security of students on campus. However, the discussion revolved around whether moving to stun gun usage is appropriate has been rattling through the halls at SF State. By training and arming UPD with stun gun weapons, the police are being equipped with a method of subduing a possible threat that is less deadly than a handgun. We should accept the new means of security as an attempt to provide more less lethal options to UPD. However, we should also demand that proper training is in place. 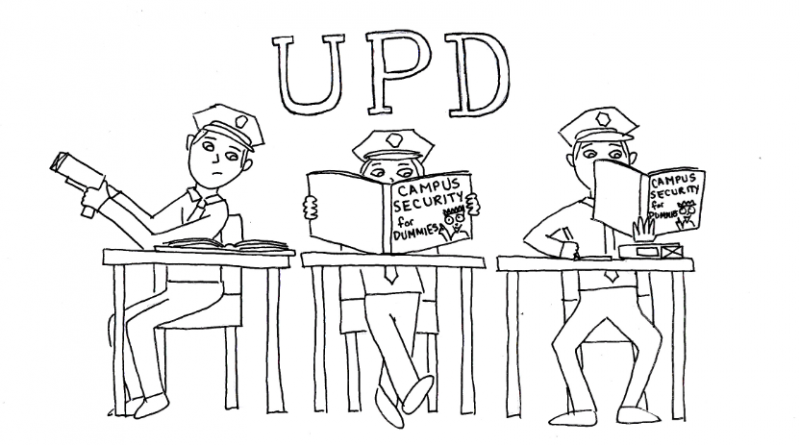 In the wake of the deaths of multiple San Jose State University students, and a recent FBI report citing an increase last year in violent crime in the Bay Area, it makes sense for UPD to want to increase security on campus. Though SF State is striving for further security through the use of new weaponry, San Francisco has been reluctant to accept the same tool. The San Francisco Police Department was turned down in 2004 and 2010 by the police commission to arm the SFPD with Taser weapons. In such a large city with violent crime on the rise according to a recent FBI report, having traditional firearms and batons — both at extremes of the weapons spectrum — and no alternative can prove troublesome. Being properly trained on how to use an electroshock weapon and under what sort of situations to use one is of the utmost importance. Though stun guns are less lethal than guns in all situations, they have been known to kill. In contrast, a study from Wake Forest University School of Medicine found that in 1,000 cases where law enforcement used Tasers, 99.7 percent of those who were shocked were only mildly injured. Appropriately knowing how and when to use any form of a weapon is something that law enforcement should be well-trained on. Equipping University Police with these arms is important to securing the safety of University students, just as much as properly setting up the protocol and importance of knowing how and when to use these weapons. As former Secretary of Homeland Security Janet Napolitano takes over CSU, expect more severe clamp downs and militarized policing on campuses across the state to be the “new normal.” This will soften you up for the police state after you leave your dorms and graduate. What does the arrests of the “non-residents” have to do with taser guns? As far as you guys have reported, there was no crime committed. Police just overreacted to the visitors. I can only imagine if the police had tasers then…. I had a really hard time sorting out the difference between the “news” article and the “editorial” article on this subject. Is the Xpress staff really that thrilled for the CSU to have new tools to inflict pain upon the student body? Hello, anyone remember UC Davis?? First thought I had, seeing this. This has the potential to be a UC Davis incident in the making Peaceful protests are not going to go well at all. What do the arrests at Mary Ward Hall have to do with safety concerns anyway? The article cited at the beginning of the article mentions protests, but not any instance of violence on either part. Give campus police tasers, let’s see how another protest goes. Even if the campus police are given “proper training” that doesn’t mean they won’t be waiting to jump at the chance to use the stun guns. In a last minute vote of the semester DSA (Disabled Students Association) does not support the use of tasers on campus. After one of our committee’s finished researching the issue we found that too many times campus police mistake a disability for intoxication and use excessive force. Tasers on a disabled person are extremely dangerous and we stand with the student majority on this.